I’m a reasonable person most of the time. I don’t have a record. I pay my taxes. I buy 2% milk and take vitamins and never litter. I follow the rules. But when I see stuff like this…well, I feel a little like a vegan trapped at a Texas barbecue. That’s CRAZY. Why do people think it’s ok to do stuff like this? And what’s more, when I put it on Facebook, a friend of mine responded with “Yeah! I saw that guy there LAST WEEK DOING THE SAME THING.” So this guy is a repeat offender! GRRRR! 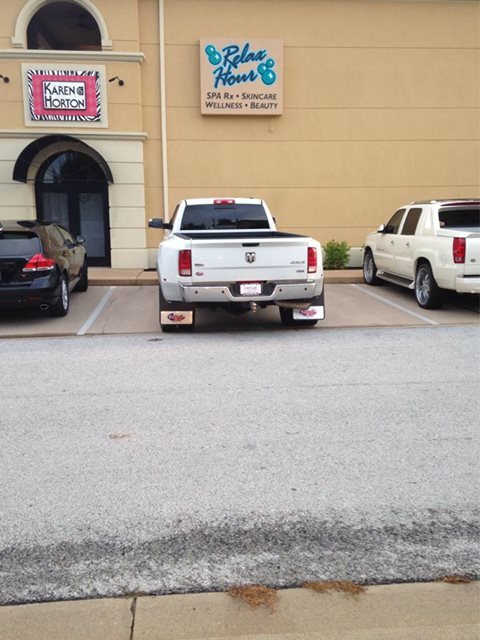 I would NEVER double park my giant truck in front of a popular sushi restaurant! That is unacceptable; only the biggest jerkwads would do that! (My dad, who never cursed, would call people jerkwads.) I might have used another harsher term under my breath. But wait. Am I REALLY complaining about having to search for a parking spot? Is this the worst thing I’ve had to endure today in my cushy world? Wahhhhhhhh! Whenever it dawns on me that I’m just as bad as Rude Truck Guy… I’m ashamed. I often hear people joking about “First World Problems.” That’s really a catch phrase for entitlement. I’m guilty of this, without even realizing it. If the lady at the drive-thru at Starbucks doesn’t immediately come on to take my order, I get miffed. Every second that ticks by I get more annoyed. What’s taking so long? I’m BUSY. I have classes to teach and minds to ignite with knowledge! I can’t be expected to work my magic without my triple capp frapp! THE HORROR. There are people going through serious health issues, mamas grieving their children taken too soon, children going hungry. These are the real tragedies. How spoiled I am! Here I am, on my way to have dinner with one of my sweetest friends (you all know her as Leigh Ann), at my favorite restaurant that is NOT cheap. Minutes before, I was watching Oklahoma with my Mancub, cuddling with my chihuahua, listening to the rain fall softly on the window of my cozy house. Hours before that, I finished up my first week of my dream job teaching students the joy of writing. I have so many things to be thankful for, but what do I post on Facebook? My outrage at this guy. Thank you for my cozy house that I have the privilege of taking care of. Thank you for my sweet hubby who puts up with my crazy ideas and my obsession with writing and literature. Thank you for my beautiful girls laughing in the kitchen, giving each other a hard time. Thank you for Mancub, who is transforming into a Godly man right before my eyes. Thank you, Jesus, for these and many more blessings. Soften my heart and show me the ones in need you would have me help. But listen, while I have you here, could you maybe send a little smiting Jerkwad’s way? Just the smallest smidge of smiting–like a giant bird doo on his precious window. If it’s not too much trouble. Amen! Do you have a First World Pet Peeve you’d like to vent about? Go ahead! I’m with you, Sister! Like this blog entry? Want to see more? Subscribe to my blog by clicking the button at the top of this page. Please and thank you! We live by the ocean and complained about sweeping up all the sand by the front door. Then we heard ourselves. Blush!